Recent studies have suggested that the glaciers that helped form the bridge connecting Siberia and Alaska began receding around 17,000 to 13,000 years ago, leaving very little chance that people walked from one continent to the other. Also, when archaeologist Dennis Stanford of the Smithsonian Institution places American spearheads, called Clovis points, side-by-side with Siberian points, he sees a divergence of many characteristics. Instead, Stanford said today, Clovis points match up much closer with Solutrean style tools, which researchers date to about 19,000 years ago. This suggests that the American people making Clovis points made Solutrean points before that. There’s just one problem with this hypothesis—Solutrean toolmakers lived in France and Spain. Scientists know of no land-ice bridge that spanned that entire gap. Stanford has an idea for how humans crossed the Atlantic, though—boats. Art from that era indicates that Solutrean populations in northern Spain were hunting marine animals, such as seals, walrus, and tuna. They may have even made their way into the floating ice chunks that unite immense harp seal populations in Canada and Europe each year. Four million seals, Stanford said, would look like a pretty good meal to hungry European hunters, who might have ventured into the ice flows much the same way that the Inuit in Alaska and Greenland do today. Inuit use large, open hunting boats constructed from animal skins for longer trips or big hunts. These boats, called umiaq, can hold a dozen adults, as well as several children, dead seals or walruses, and even dog-sled teams. Inuit have been building these boats for thousands of years, and Stanford believes that Solutrean people may have used a similar design. It’s possible that some groups of these hunters ventured out as far as Iceland, where they may have gotten caught up in the prevailing currents and were carried to North America. Some scientists believe that the Solutrean peoples were responsible for much of the cave art in Europe. Opponents of Stanford’s work ask why, then, would these people stop producing art once they made it to North America? The Pacific Ocean is bounded by America on its eastern side, stretching from 70 degrees North to 55 degrees south. As trade winds and equatorial ocean currents travel in a westerly direction, it would be foolish to assume that America did not play a part in the populating of the Pacific. Therefore, to ascertain the complexities of human migration in the Pacific region, we need to understand fully how America was populated. It appears that there have been some gross inaccuracies and misunderstandings that have led scientists to accept an oversimplified model of human entry into America via the Bering land bridge during the height of the last ice age. No consideration to the possibility that ocean crossings played a significant part in the populating of the Americas, has been given. Recent studies of the tool kits of the first Americans suggest an entry from Spain and not from Siberia. Not only this, but paleolithic Caucasian genes appear to form the basal layer of the genetic makeup of many native Americans, helping to confirm a trans-Atlantic entry into Central America between 18,000 and 12,000 years ago. Recent discoveries of three 13,000 year old Cro magnon man skeletons in an underwater cave in the Bahamas suggests that the above is true and correct. Almost all archaeology to date has been based on the discovery of sites that are above sea level. Sea levels rose to present day levels about 6,000 years ago, therefore there has to be a great deal hidden underwater prior to this event, distorting the picture of early habitation of our planet. Factors that determined human settlement 20,000 years ago were much the same as they are today, as a result the preferred sites for towns and cities would have been on the coast. The sea provided unhindered passage to other towns for trade (no mountains, canyons, powerful river currents, jungles, deserts or hostile tribes to interfere with ones passage). Not only that, but boats were the trucks of the olden days, transporting large cargoes for trade. The availability and choice of food is also more diverse along a coastline, as both land and marine produce can be obtained. Temperatures are less extreme and the likelihood of life giving rain is also much greater. Therefore almost all ancient towns of any consequence would have been by the sea and so, the great majority of towns and cities prior to 6,000 years ago are all underwater from sea level rises since the last ice age. Many megalithic monuments around the world are made from rocks that have been transported hundreds of kilometres away from their source, suggesting that large sailing boats were in use 6,000 years ago and possibly as early as 18,000 years ago. Boats were one of the earliest forms of communal transport invented by man, seaworthy boats would have expanded mans horizons immeasurably. As a result of him using the 'highways of the sea', his desire to determine where he was going, fueled a revolution in astronomy, mathematics, trigonometry and ultimately world trade. The Polar meltdown between 7,000 and 5,500 years ago talked about later in this chapter would not only have produced a rapid rise in sea level, but also, the iso static rebound would have caused subsidence of weak crustal areas such as the mid Atlantic Ridge, causing earthquakes, volcanic eruptions and tsunamis, resulting in the devastation of coastal towns and the decimation of all seafaring nations around the world. Not only did it destroy the people of this time, but also much of the knowledge which they possessed. This was not the only catastrophic rise in sea level that early man has had to deal with; there were others - 14,000, 11,600, 8,200 and 6,000 years ago. It was after these events that we find the survivors taking an interest in swamp agriculture around lakes and on highland plateaus without fear of inundation. Such areas that were chosen were Lake Chad, Lake Titicaca, New Guinea Highlands, Highlands of Luzon, the Nile, the Tigris, the Indus, the Upper Amazon, the Mississippi, the Mekong, the Yangtze and so on. With these few survivors, they would have retained only the bare essentials and much of the old technology was lost or forgotten. It appears that archaeologists may have mistaken this regrouping of man after the final floods as the beginning of agriculture and civilization. Discoveries of cities around India, Yonaguni and an underwater city in 700m of water off Cuba indicate that archaeologists have grossly misunderstood their findings and have merely scratched the surface of human prehistory. Dr Muck, an archaeologist, describes archeological sites in Pennsylvania, Virginia, and Southern Carolina, dating back 15,000-18,000 years which demonstrate that the ocean-going Solutreans may have first entered America by sailing across the Atlantic. The notion that Clovis originated in or spread throughout North America from a point of origin in the Northern Plains (within an ice-free corridor between the continental glaciers) is not supported by the distribution of finds. Clovis may actually have dispersed into North and South America from the Caribbean and Central America, much of which is now submerged, making it difficult to ascertain the exact time of entry into America. Dr. Stanford, an archaeologist of the highest caliber, turned away from the Bering route and looked elsewhere for the first migration. His thinking evolved over three decades. In the '60s Stanford, like most of his colleagues, believed that Clovis came from Asia. It wasn't until the '70s that he began to believe that Clovis was a New World development and that evidence of pre-Clovis would be found in the Arctic. "But I wasn't seeing evidence," he recalls, "and after a while it started not to make sense. Everything I found in Alaska that was fluted was post-Clovis in age." There was no technology he considered pre-Clovis. He hoped at the time that once Siberia was opened up to Western scientists we would find the missing evidence. But the end of the Cold War didn't provide the solution for Stanford and his co-theorist, lithics expert Bruce Bradley. Stanford and Dr. Bradley independently looked at the evidence and arrived at the same conclusion. They inspected late-Pleistocene sites and scoured museum collections in Siberia, Russia, and northern China, seeking pre-Clovis technology. Instead, what they found was a totally different method of making tools and weapons. 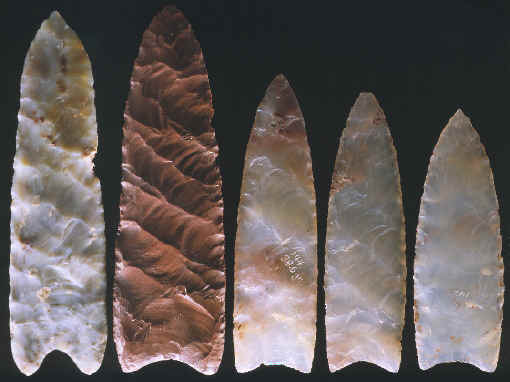 The Clovis fluted point (right) is knapped from stone, flaked on both sides (bifacial) and shaped into a beautiful thin, flat killing instrument; the base is thinned and relieved into a concave recess so that the point can be securely hafted onto a foreshaft or shaft. The Asian upper-Paleolithic weapons that Stanford and Bradley found, however, were made using a microblade technology, where tiny blades struck from wedge-shaped cores of stone were inset into long, narrow rods of bone, antler, or ivory. When Far East craftsmen tried to make bifacial tools, the result was relatively crude implements (quite thick in cross section, compared with exquisitely thin Clovis points) and frequently bi-pointed. 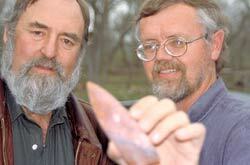 Nowhere in Asia did Stanford and Bradley find the ancestor of the Clovis point. They reasoned that if the first immigrants were Asian, they must have brought with them their inset-microblade manufacturing process, in which case there must exist evidence of a transition to Clovis technology. So far, however, nothing resembling an intermediate form between inset microblades and a knapped biface has been found in North America. Stuck at a dead end, Stanford and Bradley took up a fresh trail. The roots of Clovis, they reasoned, must lie in the Paleolithic Old World outside of Asia. They took up the search for a parent technology that specialized in making thin, flat bifacial projectile points, knives and other biface implements, and other artifacts of stone and bone similar to those of the Clovis culture. They found only one Paleolithic culture whose technology met their criteria, the Solutrean people. Named for the French town of Solutré, the culture spread across much of France and the Spanish Peninsula. They were highly efficient hunters. Full bellies gave them leisure time, which they used to decorate the walls of their caves with fabulous surrealistic paintings of bison and horses and ibex that continue to awe us today. They were carvers, too, for art's sake. "They had the only upper-Paleolithic biface technology going in Western Europe," Stanford points out. They were the first to heat-treat flint, and the first to use pressure flaking--removing flakes by pressing with a hardwood or antler tool, rather than by striking with another stone. "In northern Spain, their technology produced biface projectile points with concave bases that are basally thinned," he notes, not bothering to say he could just as well be describing Clovis points. The pressure flakes Solutrean knappers removed are so long it's almost a fluting technique--"almost," he's careful to say, but not quite. The parallels between Solutrean and Clovis flintknapping techniques seem endless. The core technology, "the way they were knocking off big blades and setting up their core platforms," he explains, "is very similar to the Clovis technique, if not identical." They perfected the outre passé --overshot--flaking technique later seen in Clovis, which removes a flake across the entire face of the tool from margin to margin. It's a complicated procedure, he emphasizes, that has to be set up and steps followed precisely in order to detach regular flakes predictably. The Solutreans set up platforms and followed the technique through to the end, exactly as we see in Clovis. "No one else in the world does that," Stanford insists. "There is very little in Clovis--in fact, nothing--that is not found in Solutrean technology," he declares. Archaeologist Kenneth Tankersley of Kent State University seconds Stanford and Bradley's opinion: "There are only two places in the world and two times that this technology appears--Solutrean and Clovis." On and on the similarities pile up. We find carved tablets in Clovis sites remarkably similar to Solutrean specimens. Both cultures cached toolstone and finished implements. Stanford and Bradley know of about 20 instances of caches at Solutrean sites; in North America, by comparison, according to Stanford, "we're up to about nine or ten." Just like Clovis knappers, Solutreans used flakes detached by outre passé to make scrapers and knives. 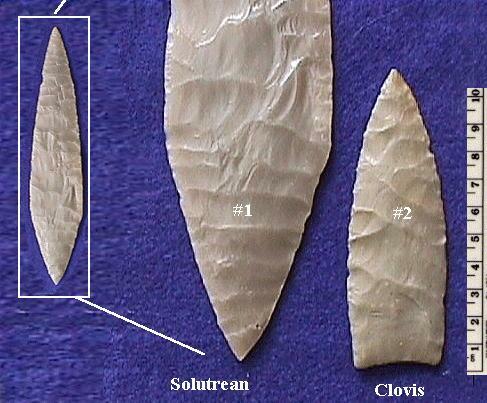 Clovis bone projectile points bear an uncanny resemblance to ones made by Solutreans. When French archaeologists saw the cast of a wrench used by Clovis craftsmen at the Murray Springs site in Arizona to straighten spear shafts, they declared it remarkably similar to one found at a Solutrean site. Proof that Solutreans were also mariners was in the discovery in 1992 of Le Cosquer cave near Marseilles by diver Henri Cosquer. Among the rock art figures are depictions of seals impaled by harpoons as well as flounder and halibut - deep-sea fish! Clearly Solutreans learned how to exploit marine resources, possibly in hide boats made from mammoth ribs. At some stage either by accident or on purpose, they caught the northern Equatorial current and favourable trade winds, to find themselves in the heart of a magnificent Archipelago of uninhabited islands. Here they flourished, discovering new plants, animals in abundance and minerals. These people have been called the Clovis hunters in America. Dr Stanford and Dr Bradley point out the discoveries in genetics by researchers at Emory University and the Universities of Rome and Hamburg. Mitochondrial DNA (mtDNA), which is inherited exclusively from the mother, normally contains four markers called haplogroups, labeled A, B, C, and D. These four are shared by 95 percent of Native Americans. Recently, however, the genetics team identified a fifth haplogroup, called X, which is present in about 20,000 Native Americans and has also been found in several pre-Columbian populations. A most interesting fact is that haplogroup X is also present in European populations but absent from Asians. The geneticists' research suggests the marker appears to have arrived in the Americas 12,000 to 34,000 years ago, not from Asia, but from Europe. As well as the Caucasian Marker X in North America, the Araucanians of Chile also have significant Paleolithic Caucasian genes in them, most likely arriving from Spain between 18,000 and 12,000 years ago. It is common for them to have curly reddish brown hair and green eyes. The red haired Caucasian Paracas mummies of Peru is also proof that Caucasians were part of the indigenous culture of America. I also found that in 1892 the Easter Island scripts were deciphered by A. Carroll, M.A., M.D., but have been ignored. They are a detailed history of tribal conflict in South America, leading up to the exodus to Easter Island! They mention tribes from the ancient land of Tulapin (Turtle Island), the Eagle Clan and the Children of the sun or Ra. They were all Caucasians. Archaeologists are just beginning to realize that to understand European prehistory, American prehistory must also be considered. The Solutreans of Spain are now believed to have crossed the Atlantic using the southern Equatorial current and entered the Caribbean and Central America between 18,000 and 12,000 years ago to become known as the Clovis hunters of America. Recent genetic findings suggest that the people now known as Gaelic speaking Celts (including Irish, Welsh, Scots, Basques and Berbers) are a remnant of a group of people who also left Spain between 1,8000 and 12,000 years ago and spent 6,000 years isolated from Europe before returning, bringing the Megalithic culture to coastal Europe. "Genetics provided more reliable clues to the distant past than language did". He and colleagues at University College, London, have spent years creating a genetic map of the Y chromosome, which is passed by males from generation to generation. The results show that the Welsh are related to the Basques of northern Spain and southern France and to native Americans. He said: "There has been much less interbreeding in Wales than you might expect. Wales and Ireland have the most homogenous group of males of anywhere in the world, from the research that's been done so far". He said; "The Y chromosome common among Welsh males was an ancient one. Most native Americans have the same one. Surprisingly perhaps, the genetics show that the Welsh are not related to the Cornish, despite the similarity of their languages. 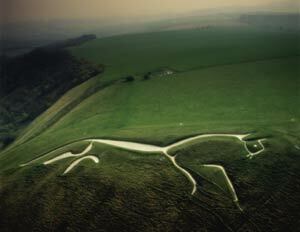 The Cornish are in effect Anglo-Saxons who for a time used a language that was hanging around. The genes of Scottish males betrayed considerable inter-mixing with outsiders". James Wilson and Prof David Goldstein of University College London, with colleagues at Oxford University and the University of California, found that Welsh and Irishmen are genetic blood-brothers of the Basque people. "The findings provide the first direct evidence of a close relationship between the people known as Celts and the Basques. The gene patterns of three races passed down through the male line are all strikingly similar, researchers concluded. Basques can trace their roots back to the Stone Age and are one of Europe's most distinct people, fiercely proud of their ancestry and traditions. The team looked for similarities between the Y chromosomes (which are only carried by men) they sampled DNA from; 88 “Celtic fringe” individuals from Anglesey, North Wales, 146 from Ireland with Irish Gaelic surnames, and 150 Basques, revealing “remarkable' similarities. On the other hand, he and his colleagues compared Celtic and Norwegian populations and found them to be quite different. The Celts carried the early Y chromosome, which provides the first clear evidence of a close relationship in the paternal heritage of Basque and Celtic speaking populations. “They were statistically indistinguishable', we also noticed that there's something quite striking about the Celtic populations, and that is that there's not a lot of genetic variation on the male Y-chromosome, We conclude that both the Basques and Celts are reflecting pre-farming Europe. Somehow these people have remained in isolation from the rest of Europe up until the Bronze age where their genes begin to indicate an influx of female genes from mainland Europe" said Prof Goldstein. The other scenario is that these people were not living in Europe, but were in the Caribbean, the East Coast of America and on islands in the Atlantic. Barry Fell, author of 'America B.C.' is an accomplished decipherer of ancient scripts and has managed to identify a great deal of Celtic, Phoenician, Iberian, Egyptian, Berber, Libyan and Viking scripts in America, indicating that a great deal of trade contact occurred during and after the Bronze Age, but ceasing around the time of the beginning of the Roman Empire. Apparently these great ocean navigators, after the destruction of Carthage, decided to withhold all information on navigating to the Americas from the Romans and by the end of the Roman Empire and the onset of the dark ages, much was forgotten about trans Atlantic navigation and the Americas. Barry Fell has identified Ogham script in America, Ireland, Spain and Africa that goes back to at least 800BC. Early Egyptian scripts were used by the Micmac of North America right up to the arrival of Missionaries. He also identifies many early style Celtic Megalithic monuments on the east coast of America, in particular New England, New Hampshire, Vermont and Woodstock, they take the form of Dolmens, Phallic menhir, Men-a-tol, massive stone Druid's chairs, megalithic chambers, Solstice and Equinox viewing chambers and burial mounds. These all parallel similar structures in Coastal Europe, especially on the Dingle peninsular, Brittany and some sites in Spain. As usual, this work has been ignored by the Eurocentric 'No one before Columbus' fraternity. Although Barry Fell did not go further than assert that most Celtic connections occurred around the Bronze Age. He was not aware of the more ancient genetic connections the Celts had with the proto-American Indians. With further studies done, more accurate dating of the Dolmens and other megalithic monuments will possibly show that some American megaliths may actually predate the arrival of Celts on the Dingle peninsular in Ireland, indicating that the Caribbean and America was the original homeland of the Celts. Giant stone shark in the Bahamas (upper right) created in a similar way to the white horse of England (left), suggesting a distant cultural connection between these separate groups of laterally thinking people that created images only apparent from the air - supposedly for the spirits in the heavens to view - in effect a gift to the gods.